Have you been injured by a distracted driver? A distraction in this case would be considered to be anything that takes the driver's attention away from the road and the task of driving. It is very important that drivers give their full attention when operating a motor vehicle because you need to be able to respond and make quick decisions in case of an accident. Distractions also make it very easy for drivers to violate traffic laws which are a large part of why car accidents happen. 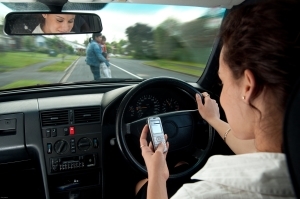 Distracted driving has become a new epidemic here in the United States because of the growth of cellular technology. The statistics for these types of accidents can be shocking. Reports show that there were over 3,092 people killed and 426,000 people injured in distracted driving accidents in 2010 alone. This distracted driving statistics are almost as troubling as drunk driving statistics. Searching for a lawyer for your car accident case in Walker County? Here at Warren & Associates, LLC we want to make sure the at-fault party pays for their careless and negligent choices. Our firm has been handling personal injury cases for over 23 years and we can help you hold the distracted driver accountable for paying for any financial and non-monetary damages. You should not have to pay the price for someone else's poor decisions. If you were hit by a driver who was texting, talking on the phone, eating, or otherwise distracted, then speak with a Jasper car accident attorney from our firm today. Our firm can work diligently to ensure that you get the maximum amount of compensation that you are entitled to under the law. One of the most dangerous distractions is texting and driving, this is because it takes you mental, physical and visual focus away from the road. With your eyes, hands, and minds off of the road, your chances of getting into an accident grow substantially higher. If the other driver was doing something that takes their mind and attention away from the task of driving causing them to hit your vehicle, then you may be able to file a claim against their insurance for restitution. Because these types of accidents have grown to be so common there are many news laws forming and organizations starting up that are committed to combat distracted driving in the U.S.
Was your car accident caused by a distracted driver? Our Jasper car accident attorneys here at the firm have seen the pain and devastation that distracted driving can bring upon a family. If you have been injured by a distracted driver, we can work to make sure that your medical bills, hospital costs, lost wages, are fully reimbursed. Insurance companies can try to push you around and take advantage, but we will make sure that they do not make a profit off your case. Let us help you hold the at-fault party accountable for paying the damages. Our firm takes on a wide range of car accident cases and we know how to secure positive results. Contact Warren & Associates, LLC for high quality legal service in your distracted driving case. Call (205) 221-1044 today for a free consultation!